To inoculate you for the news carried in this post, I'd like to point out that wishful thinking is not the same as hope. In fact, to the extent that it postpones action, wishful thinking can be thought of as the enemy of hope. Bad news is much more easily accepted if we feel confident in our capacity to work together as a community to respond. Princeton has a real challenge ahead if it is to keep its protective canopy of trees in coming decades. There are the losses in recent years due to storms like Hurricane Sandy, the ongoing attrition as some pin oaks and red oaks succumb to Bacterial Leaf Scorch, and then there is the gathering storm just to our west of the emerald ash borer. Through a recently completed tree inventory, Princeton can now look at the numbers, and they don't add up--the number of trees likely to be lost dwarfs the number of trees being planted. Here are the numbers, rounded off for easier math, as presented by Bob Wells of Morris Arboretum, who directed the inventory and integrated it with an earlier survey of borough trees done by Jim Consolloy. These are only the trees growing in the street right of ways. Trees in parks, preserves, and on private property are not included. Of Princeton's 19,000 street trees, 3000 are in poor condition--unlikely to live beyond the next five years. Another 6000 are in fair condition, with an estimated life expectancy of 5-15 years. Even those trees in good condition are threatened by a growing collection of invading insects and diseases, along with the increasing weather extremes associated with climate change. For instance, some of Princeton's 1400 pin oaks and red oaks will continue to be lost to Bacterial Leaf Scorch. Compare those numbers with the current replacement rate. Princeton purchases and plants about 60 trees each year along the streets. Its tree crew takes down about 250 trees each year in parks and along streets. The numbers offered up by the tree inventory estimates the annual loss of street trees to be a minimum of 600. By this math, we will be losing ten trees for every one being planted. And this doesn't even take into account the imminent arrival of the Emerald Ash Borer. Perhaps most worrisome is the looming threat to Princeton's most common tree, the ash. We can expect to lose most of our 2200 white and green ash trees along the streets in coming years, plus the tens of thousands in our woodlands. 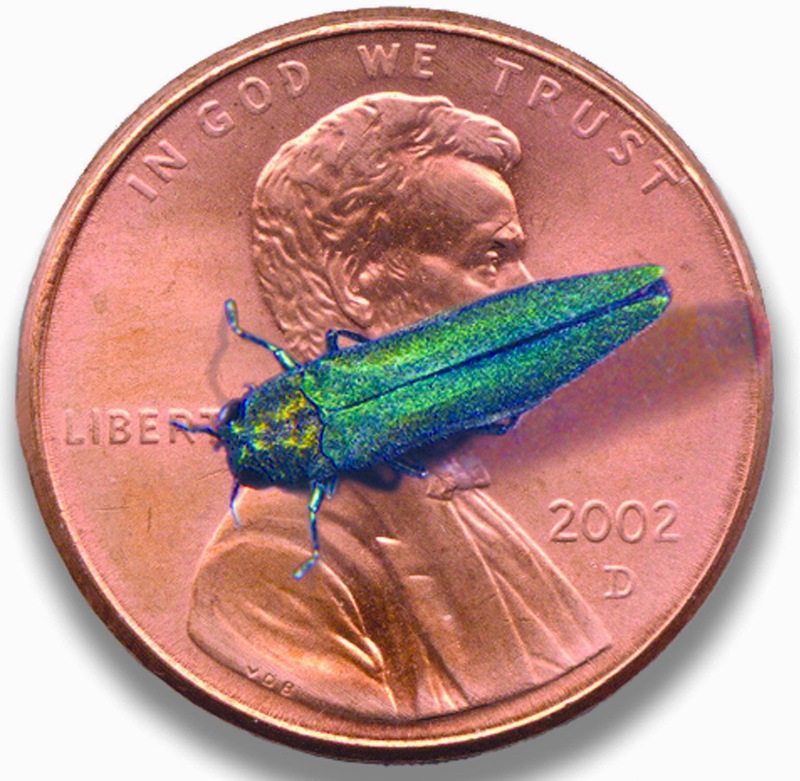 The culprit is the emerald ash borer (EAB), an insect that hitch-hiked to southeastern Michigan in wooden packing crates from China, then proliferated to kill 50,000 trees before anyone knew what it was. Since its identification in 2002, EAB has been radiating out across the midwest, killing tens of millions of trees, including a relentless spread eastward through Ohio and Pennsylvania to the border with New Jersey. A map at this link shows New Jersey essentially surrounded by infestations in bordering states. As chance would have it, the original EAB infestation occurred just north of Ann Arbor, MI, where I used to live. The city of 100,000 had to spend $5.8 million removing 10,000 trees. Interestingly, ash continue to sprout in the woodlands there, and can grow to 6 inch diameter, but the chances of their growing to maturity are slim. Princeton has dealt with threats to trees in the past. A bacterium called Bacillus thuringiensis (BT) has been used to reduce the impact of gypsy moths. According to Greg O'Neil, Princeton's arborist, the wooly adelgid's attack on our eastern hemlocks was slowed down by pesticide, after which the pest appears to have "cycled through", allowing many hemlocks to survive. There is, however, no known control for emerald ash borer other than individually treating each tree, and even then the results are mixed. As an added complication, Imidacloprid, the most frequently mentioned systemic insecticide for protecting ash trees, may be contributing to the decline of honey bees. The sooner we acknowledge the depths of the challenge we face, the more proactive we can be, and the better the prognosis for Princeton's tree canopy. There are a number of actions that can be taken. Treatment for ash trees that are particularly cherished is best undertaken before the emerald ash borer arrives. To better spread the work of removal over a number of years, some of the younger or less healthy ash trees can be taken down and replaced with another species before the invasion hits. The municipality should at least be planning for the extra staff needs and the seven figure expense coming down the pike. The big question is how to replace so many trees with a limited budget. The more gaps in the street canopy, the more pavement is exposed to the sun, which through the "heat island effect" causes the town to be hotter than it need be in the summer. At $200 a piece, new trees aren't cheap, and then there's the planting and followup care to insure they survive. One approach I'm exploring, as a member of the Princeton Shade Tree Commission, is transplanting "volunteer" trees that sprout in people's yards. Some species are more appropriate than others, and determining where to plant them along the street requires some guidance. Perhaps we can come up with a guide, and motivated neighbors could take initiative in their neighborhood to identify gaps and work with willing homeowners to get trees planted in an optimal place and manner along the street. Given the infinite reasons that can be summoned for inaction, such an approach will only work if people see how their own needs can be met by participating in the collective endeavor of shading our streets. For me, the hope lies in the growth force and the natural affinity people have for trees. It's remarkable how quickly the red oak in this photo, which sprouted on its own in my next door neighbor's yard not that many years ago, has grown large enough to cast much-needed shade on our driveway. Neighbors a couple doors down have transplanted volunteer trees to key spots in their yard--to shade the house, provide habitat for birds, and provide buffer from the street. After just a few years, they are robust young trees--a white oak, pin oak, American elm and tulip poplar. Another friend is growing a pawpaw and a fig in a sunny spot in their backyard--going for food rather than shade. Each kind of tree has its strengths and potential drawbacks and vulnerabilities, but after years in which Princeton's landscape was dominated by mature trees, it's refreshing to see young ones coming on the scene, filling the voids, reaching for the sun. Related to this, the opening reception for an art exhibit entitled "The Fallen and Unfallen: Trees in Peril" is Nov. 1 at the DR Greenway, 5:30 to 7:30. More info here. With paintings and photographs, it celebrates trees while also identifying some of the threats they face, in little snippets of info like this one. Where in Princeton can you look out upon a marsh, and see or hear hundreds of species of birds along the nearby trails over the course of a year? Rogers Refuge is a star among Princeton's nature preserves, but it keeps a low profile in the lowlands just down from Institute Woods and just up from the Stony Brook. A nondescript sign on Alexander Street, just before the canal bridge, directs you on to a nondescript road called West Drive. Take West Drive to a fork in the road, where another sign, a little more emphatic, points you down the left fork, a narrow gravel road that winds through Stony Brook's broad floodplain. Watch out for potholes and cars or trucks coming the other way--a small water plant is located back there. There's a small parking lot on the right, with a path leading to an observation tower. The Friends of Rogers Refuge help manage the property. Members Lee and Melinda Varian hauled the stone to improve this trail, a bit farther down the road from the parking lot. The short trail leads to a birdblind. Friends of Rogers Refuge (FORR) is associated now with Friends of Princeton Open Space, which is a certified nonprofit and can accept donations in FORR's name. Though the refuge adjoins the Institute Woods, the land is actually owned by the American Water Company, which teams with the town of Princeton to maintain a pump that keeps the marsh marshy during droughts. Both the Washington Crossing Audubon and American Water have provided some funding at various times to help with FORR's management of the refuge. It's a great example of how preserves often need human intervention to sustain the quality of the habitat. Partners for Fish and Wildlife, part of the federal government, came in years back to knock out the highly invasive exotic Phragmitis reed that was taking over the marshy area. That is an ongoing battle, as will be the more recently arrived porcelainberry, seen here climbing up a tree, which has proven its kudzu-like invasiveness not far away at Princeton Battlefield. It's very difficult, as distracted humans, to nip these invasions in the bud, while the undistracted plants are quietly growing and expanding 24/7. It is the friends group of volunteers that plays such a critical role in identifying problems, then harnessing and coordinating the resources of these private and governmental entities to protect this special habitat down along the Stony Brook. That, along with the labor of love that goes into maintaining the trails, replacing handrails on the observation tower that were hollowed out by carpenter bees, and all the other acts large and small, are gifts back to a nature that feeds us with its beauty and diversity. Though the periodic meetings of FORR must deal with problems like invasive species and concerns about the downward trend in migratory bird numbers, much of the discussion is a sharing of joy at what birds were recently seen, which species are becoming more numerous as the habitat improves, and which guests the birdhouses have been hosting. Lots of other posts about the refuge can be found by typing the word "rogers" (no quotes) into the search box at the top of this website. Not that I want to stick my nose into another's affairs, but when another sticks its rose into a public thoroughfare, someone's bound to get a thorning without a warning. If the scent's not bred out of it, though, I might be predisposed to spare the air the thorn of my discontent, and stick my nose in the rose instead. What kid will be brave enough to knock on this door come Halloween? Actually, it looks pretty friendly, though the treats may prove too small to satisfy. You can be forgiven if you don't recognize this intimate home in Princeton right off the bat. Here's a hint: a stump along Hamilton Ave. bedecked with autumn clematis. Here's another hint, across the sidewalk from the stump--the elegantly set table with an eternal bottle of wine ready for the guests who never seem to arrive. If a tree must die, there is comfort in knowing it will live a long and productive life after death, feeding the micromultitudes and the imaginations of passersby, yielding ever so slowly its grip on the ground. Here are the lateral branches of a poison ivy vine that has climbed a tree. "Leaves of three, let it be" is a fairly reliable rule, though there are some other plants that have leaves of three, such as box elder. On the lateral branches you'll find white berries this time of year. "Berries of white, run in fright" is the rhyme offered by the Washington Post's illustrated guide to "Poison ivy's toxic mnemonics". Lest we vilify too much, a friend at the NC Botanical Garden writes that "poison ivy fruits are reported to be eaten by more birds than any other fruit – so it’s an important food in the general avian world." Of the hairy main stem of the climbing poison ivy vine, the Post article says "Hairy rope, don't be a dope", but the one I've heard is "If it's hairy, it's scary." One scary result of research referenced in the Post article is that poison ivy grew twice as fast when exposed to 2007's atmospheric carbon dioxide levels, compared to 1950's concentrations. This begs the question of how other plant species are responding to our 40% increase in carbon dioxide levels in the atmosphere. The lateral branches of poison ivy can be mistaken for the tree that the vine is using for support. Along the towpath, this gradient of autumn color from top to bottom suggest that the upper leaves get more sunlight, and so have a richer fall color. Some poison ivy leaves turn a brilliant orange in the fall. Bear with me, for though this wooly caterpillar bears some resemblance to a wooly bear, it is not. One of the Rotary Club volunteers helping out at Herrontown Woods this past Saturday (thanks Rotary Club!) had found a wooly bear earlier, but this one was bigger, and all black, without the wooly bear's middle patch of brown. Those are red stripes inbetween rings of fuzz. It was quietly pillaging leaf matter from the slim pillar of a young black locust tree next to the trail that passes by the Veblen cottage. Some research yielded a name: Giant Leopard Moth, and if you look at the photos of the adult moth, you'll find the name's likely source is a snow leopard--white with a beautiful pattern of black dots. "Giant" in this instance refers to its 3 inch wing span. This is all one leaf on the black locust (Robinia pseudoacacia). Unlike many caterpillars that are very picky about their host plants, the Giant Leopard Moth caterpillar feeds on many species, including dandelions. Lions, leopards and bears, oh my. A well-coiffed frontyard garden on a quiet street. I was standing there talking to a friend, watching the bumblebees peacefully feeding on nectar, when I saw something else move in the mass of blue flowers. That something else was watching the bumblebees far more intently than I. As a bumblebee alighted on a nearby flower, the praying mantis would tilt its head to get a closer look, shift its claw-like front legs, patiently waiting. I continued to talk with my friend, while wondering if a bumblebee would land close enough for the praying mantis to strike. The mantis must have known it was just a matter of time. Location, location. Obviously, no ethical standards have been developed in the mantis world about waiting for the prey to die before starting to munch. Few of us will get to see lions stalking wildebeest in the Serengeti, but every now and then, a similar drama can be caught by an itinerant eye, no farther away than a neighbor's garden. A friend is very excited about harvesting black walnuts this year, having heard great things about their health benefits. There's the small matter of reaching the meat, however, well guarded by the green hull and the extremely hard shell. One technique for removing the hulls is to drive over them with a car. Traffic along Harrison Street was being very cooperative in this regard, but I was a little leery of collecting nuts so close to a busy road. If you're moved to give black walnut harvesting a try, here's one of many links with instructions. Most walnuts go begging, like these on the lawn at Brearley House. That leaves an abundance for those willing to give harvesting a try. Best to be armed with a good nutcracker. Below are the results of my research. Smaller nutcrackers like the Reed get high marks for everything but black walnuts, so you'll need something larger and stronger. Here's a recommendation from a friend: "I have a Gardner nut cracker which I am very happy with… I think the cost is around $80 and it works very well with thick-shelled nuts like black walnut, butternut, and hickories and hicans. (I am also told there is a Chinese knockoff to be avoided.)" He also mentioned a Kenkel model. There's also a Hunt nutcracker that came up in an internet search. Check the links for more info and background. This monarch visited our backyard October 1. Most of its fellow monarchs, what few there have been this year, have long since headed south towards the mountains northwest of Mexico City. A lot of people are worried about their low numbers this year, and are following its fall migration. For periodic updates, there's the monarch monitoring project in Cape May, through which many of New Jersey's monarchs are funneled. Nationally, the best I have found thus far is the Monarch Butterfly Journey North website, which includes periodic updates and a "Where are the monarchs?" page that details their travails. As with any complex entity, whether it be a car, the human body, the climate, or an ecosystem, one doesn't need to know how it works unless it starts breaking down. Thus, a lot of attention is being paid to how the monarch migration works, and what is causing it to diminish. For anyone interested, longtime monarch advocate Chip Taylor offers an indepth look at how migration works, how weather and farming practices are affecting it, and what we can do to help the monarchs prosper. The video's is worth an hour of one's time. Of the 73 species of milkweed growing in the U.S., common milkweed (Asclepias syriaca) supports 90% of the monarch population. It is not found in mature prairie, but rather is adapted to disturbed sites, such as roadsides and farm fields. In the distant past, when prairie covered much of America's heartland, the many species of milkweed that thrived there would have provided the monarch larvae food. But the conversion of nearly all of the original prairie to farms has made the monarchs dependent primarily on the common milkweed that can survive in the farm fields. Beginning in the 1990s, however, the introduction of "Roundup Ready" GMO corn and soybeans brought about a dramatic transformation in farms across the Midwest. Using Roundup-proof crops allowed the intense spraying of herbicide, which led to the elimination of milkweed from more than 90% of its original farm habitat--about 160 million acres! Additionally, as government began subsidizing ethanol projection in 2006 or so--an ill-conceived program that speaks more to the political power of sparsely populated cornbelt states and less to common sense--corn demand and prices leaped upwards. Farmers responded by expanding their fields, eliminating fencerows and plowing right up to the road, erasing even more habitat that formerly supported milkweed. Though weather has long been variable, global weirding, as it's sometimes called, is making these variations more extreme. A spring that's too warm, a summer that's too cool, a drought that's too deep--all of these can make for low monarch numbers in any given year. One interesting twist is that some drought can actually be a good thing for monarchs, if the dryness reduces the fire ant numbers while not affecting the deep-rooted milkweed. Conditions in Texas are particularly critical as the monarchs move north from Mexico in the spring. Taylor calls it the "breadbasket" for monarchs, spawning the first new generation that then flies up our way. (Think of the migration as a multi-stage rocket fueled by milkweed, with each generation building on the boost in momentum provided by the previous one, until the season's fourth or fifth generation heads back south in the fall. No fuel, no momentum.) As an example of the impact of extreme weather, he described a phenomenal loss of trees--300 million--across Texas due to the 2011 drought. Seeking to compensate in some small way for the human folly that's being perpetrated on a grand landscape scale, they have a WayStation program in which people all over the country register their monarch-oriented gardens. This one in the photo, along William Street, looks like a good candidate. It has two key plants for the monarch--for the larvae, the common milkweed with its light green pods in the background, and for the adults, the New England aster whose bloom is well timed with the monarch's fall migration. Princeton needs more family-oriented restaurants like this one. Previous post on monarchs here. Management of deer, coyotes and fox was the subject of this past week's Princeton Animal Control Committee. Some realities were laid out and some recommendations made. I offered a few remarks during the public comment period, describing the ecological benefits of continued deer culling, questioning the need to manage the fox populations--given that fox numbers tend to be cyclical, tracking the ups and downs of prey species such as rabbits--and expressing interest in hearing why coyote would need to be managed. Given that the native timber wolf was extirpated from NJ, the spread of coyotes eastward into NJ can be seen as partially filling an important ecological niche. They feed primarily on rabbits and rodents, occasionally taking young or weakened deer. Both field mice and deer carry the deer tick that spreads Lyme. Animal Control Officer Mark Johnson described recent incidents with coyote, which center around Princeton Community Village up on Bunn Drive. A couple pets that had been left off-leash have been lost, and there was one incident in which someone was followed by a coyote. The Institute Woods is the other location described as a hot spot for coyotes, with numerous neighbors making reports. One committee member said her kids no longer feel comfortable sleeping in the backyard. Mark mentioned an attack on a child elsewhere in NJ, which I traced to reports of two alleged attacks in Middleton back in 2007, in a neighborhood that borders an extensive wooded naval base. The state DEP website lists recommendations to limit human-coyote interactions, including to keep pets indoors at night, and don't leave food outside. Reports of sightings in Milltown and New Brunswick this year included instructions to make lots of noise to scare coyotes away. One interesting comment, unconnected to management decisions, was that the local coyotes are considerably less attractive than the pictures the DEP has up on its website. Having seen some beautiful coyotes recently in Durham, NC, I asked if there might have been some crossbreeding with dogs in NJ, but Mark was doubtful. Any management effort would be aimed not at removing all coyotes, but limiting their numbers so as to make encounters with people less likely. Deer management was also discussed. Customarily, bow hunting for deer is allowed starting in December in Herrontown Woods and Autumn Hill Reservation, with the professional White Buffalo service beginning its work in Princeton in January. Bow hunters took only ten deer this past year, less than 10% of what the professional service takes. If the professionals are not hired, then deer numbers increase and more deer end up being killed along roadsides. The venison goes to local food kitchens. The latest data on deer killed by vehicles showed an increase of 25 deaths in 2012, following Princeton's one year suspension of its professional deer culling program. This year, following resumption of wintertime deer culling, road kill is down by a similar number. The consensus of the committee was to recommend continued culling of the deer herd as in previous years, and adding coyote control. The two can be done concurrently. Management of fox, however, was not recommended this year, in favor of continued monitoring. According to Mark, though coyote are thus far limited to woodlots, fox have moved into the fabric of neighborhoods, living under porches, usually without the owners being aware. A few people have been followed by foxes, and one reportedly attacked a dog--an encounter that ended with the fox running away. Also unlike coyotes, fox don't form packs, but tend to be seen singly or in pairs. Mark said the call of the coyote can be heard in Herrontown Woods at dusk, though my visits there recently have been serenaded only by two great horned owls. May have to stop by for another listen. A couple on the street the other day recognized me as a botanist at large, and asked about a flower they'd seen, like boneset but lacking the fused, perfoliate leaves. They summoned a photo on their iPhone. "Late-Flowering Thoroughwort," I announced. Given the length of the name, some people slim it down a bit by replacing "thoroughwort" with "boneset". It's a beautiful, delicate-looking plant, even though it toughs it out along roadsides, and is more common in the wild than boneset. In the garden, it sometimes seems fickle, dying out in one spot then seeding into another. This may have to do with drying out, because the consistent rains this summer have coincided with its most prosperous year in memory. Eupatorium serotinum is the latin name. Another favorite, one of the few exotics I still like to plant from my less native-oriented days, is showy stonecrop, here shown with the shrub Virginia sweetspire gaining its rich fall color in the background. This kind of stonecrop (Sedum spectabile, unless you really want to learn the new latin genus name, Hylotelephium ) has a flower that gradually shifts color in the fall from light pink to deep red to a chocolate brown. New England aster can look a little lanky in the garden until it finally blooms, at which point it looks just right. It feeds what few monarchs we've had during their fall migration south to Mexico. Once again, the sunchokes (Helianthus tuberosa) were allowed to grow, despite vigorous spring pulling of hundreds of shoots. Their splendid flowers this time of year distract from their imperialistic underground spread. What's needed is a human to come along and eat its tubers throughout the winter, so that only a few will be left in the ground to sprout in the spring. Sounds like a win-win, if the resident human will get his act and his appetite together. The "Fireworks" goldenrod (Solidago rugosa) grows at the Barbara Boggs Sigmund Park on Hamilton Ave. It's a native originally named by a friend from Durham days, Ken Moore of the North Carolina Botanical Garden. What to make of this headline on the Princeton University website: "Fall football lecture will discuss wildlife conservation". Are mascots threatened? Are football teams finally starting to donate a portion of ticket sales to preservation of the wild animals their mascots are based on? A case could be made that, much as we as a nation have long drawn strength from the majesty of our land, so might football teams draw strength from the wild manifestations of their mascots. "African Grand Challenges: Can Wildlife Conservation and Human Development be Balanced?" a lecture to be "given at 10 a.m. Saturday, Oct. 5 in Lewis Library, Room 120. Dan Rubenstein, Class of 1877 Professor of Zoology and professor of ecology and evolutionary biology, will give the lecture prior to the football game in an event sponsored by the Alumni Association." One year into their residency in our backyard, our ducks and chickens continue an improbable output, with the ducks laying daily and the Aracana chickens somewhat less productive. Most of the duck eggs are only slightly larger than the chicken eggs, but now and then the large Pekin duck lays a double yolk whopper, like the one on the left in the photo. Next to it is a chicken egg (more pointed), and a miniature duck egg perhaps laid by the mother mallard whose chicks are nearly grown. The red oak acorn is included for scale. The duck eggs have thicker shells, which may owe to the ducks' great interest in filtering through dirt and mud with their beaks, which no doubt increases their consumption of minerals. We try to keep the dirt in the backyard as clean as possible, for their eating pleasure. The miniature egg laid by the mother mallard--the first since she had ducklings--had no yolk at all. A friend tells me that duck eggs "taste like other eggs only more." In a frying pan, the duck egg on the right is barely distinguishable, with only a slightly larger yolk than the chicken egg. Once we found a cache of eggs in a tight spot in the coop that was out of sight. Since eggs slowly dry out over time, with air displacing some of the eggwhite, the older ones will angle up or become completely vertical in water, depending on their age. The eggs we found make a series, with gradations of tilt and, presumably, age, starting at ten o'clock and going counterclockwise. The large influx of eggs crowding our frig causes us, counterintuitively, to eat fewer of them, much like the spectacular production of sunchoke tubers can reduce the desire to eat them. It's a reflex that has to be consciously countered. Tomorrow, Thursday, at 8:30am in Town Hall on Witherspoon St, Princeton's Animal Control Committee will meet to discuss options for controlling the population of deer and, for the first time, coyote and fox as well. Reports at Planet Princeton and the Princeton Packet provide some background, though the reason why fox numbers would need to be controlled remains a mystery. The population of predators like fox tends to be cyclical. As rabbit or other prey numbers increase, the fox population increases, which in time greatly reduces the prey population, which then causes a crash in fox numbers. Low predator numbers then allow the prey population to increase again, and the ten or fifteen year cycle repeats. Background on the deer control program can be found further down in this post, and also at the "essays" tab of this website. The photo is of four deer encountered at dusk at Herrontown Woods recently. They had been lying in the field before I came around the corner of the Veblen House. They are beautiful creatures, and encountering them in the woods can be magical. That truth does not erase the other reality, which is that when their numbers grow unrestrained, with none of the predators that historically provided control, their appetites can do tremendous damage to a woodland. Because their tastebuds have not evolved to take more than an occasional nibble out of the abundant non-native species that have invaded woodlands, they feed heavily on what few native shrubs and herbaceous plants can be found in the woods, further shifting the woodlands to inedible exotics. The two spicebush in the photo tell the story of how native flora have begun to rebound as deer numbers have come more into ecological balance. 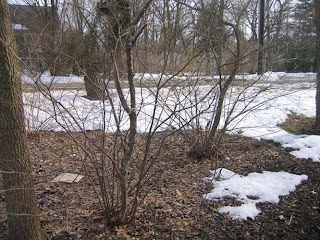 Spicebush is a native shrub important to wildlife for nesting and food. Because of its strong taste, it's not one of the deer's favorites, but an overabundance of deer forces them to eat it. You can see the main stem and then many new stems growing up from the base. Back in 2000, spicebush were struggling to survive, sustaining themselves with one stem that was too tall for the deer to defoliate, while new shoots would be repeatedly eaten down to stubs by deer. Only after the intense browsing pressure was brought down through professional control could the many new stems grow to maturity, and the shrub once again fill its niche in the forest. Below is some background on the deer issue that I wrote after Princeton suspended its professional deer control efforts for a year, back in 2011, before resuming funding. Talk to most any land manager in New Jersey about what poses the biggest threat to biodiversity, and they're likely to say deer overpopulation. Traditional predators of deer, such as wolves and mountain lions, were long since extirpated from the region, resulting in a highly destructive ecological imbalance. Since the imbalance is human-caused, it's important that deer policy fill the void left by banished predators. For ten years, Princeton Township lived up to that responsibility to compensate for a broken food chain. Since hunters were not proving sufficiently effective in controlling deer numbers, professionals were brought in each year to reduce the deer population to a more ecologically sustainable number. The harvest went to food kitchens to feed the poor. The policy was controversial, particularly in its first few years, but the ecological and public safety benefits were clear. It can also be said that life for the remaining deer was greatly improved, as their preferred foods were given a chance to rebound. According to data obtained from Princeton Township, roadkill reached a peak in 2000 of 342 deer killed on the roads. In that same year, Princeton township hired professionals (White Buffalo) to reduce the size of the deer herd. White Buffalo took 322 deer that first year. By 2010, the number they were able to cull had dropped to 148. The lower number reflects a successful reduction in the deer herd. Deer killed by amateur hunters went from a high of 255 in 2000 down to 68 in 2010. The primary goal of this ten year program was to reduce the number of collisions with deer on the road, and annual roadkill numbers reflect the success of the program, dropping from the high of 342 in 2000 down to 68 in 2010. Also noticeable during this ten year program was a marked rebound in native vegetation in Princeton’s nature preserves, as browsing pressure was reduced. For the year 2010/2011, the township decided to terminate its contract with White Buffalo, to save money and to see if hunters could provide adequate control of deer numbers. Data for the year has not yet been received, but it can be pointed out that amateur hunters were unable to control the deer population in the 25 years leading up to 2000, when roadkill numbers rose steadily from 68 in 1975 to 342 in 2000. Even from an animal rights point of view, one could argue that the program has been a success, actually reducing the total number of deer killed annually in Princeton Township over time. In 1999, the year before the professionals were brought in, 555 deer were killed in the township by vehicles and hunters. In 2010, after ten years of professional deer management, the total number killed by vehicles, hunters and professionals had dropped to 286. With the end of professional management, history suggests that that number will begin to rise. A 2002 NPR piece did a very good job of reporting on Princeton's investment to bring the deer population into greater ecological balance. It reported that 16,000 deer were killed on the roads of NJ back then. With a wetter than usual summer, it's been a good year for growing stiltgrass. Everybody grows stiltgrass, though not intentionally. It can grow four feet high along fencelines and in neglected flowerbeds. It's easy to pull, but frustrating in its abundance, so most of it survives to set seed on skinny stems with sparse leaves that perhaps explain its name--the leaf being the foothold on the long stilt. In this photo, one of the smartweeds (Polygonum) with similar leaves but small pink flowers can be seen at the bottom. Stiltgrass also spreads into lawns, particularly in wet years, causing a blotchy appearance. Remarkably, it can still set seed even when kept mowed down. Even someone who doesn't particularly like lawns can grieve at the sight of an old-style soft fescue lawn succumbing to incursions of stiltgrass. Pre-emergent herbicide? Corn gluten? Or else use the infestation as an excuse to dig up the lawn, plant shrubs, perennials or vegetables, and mulch well enough to prevent the annual stiltgrass from growing. Past posts on stiltgrass (Microstegium vimineum) can be found by typing the word (stiltgrass) into the search box at the top of this page. This is the time of year people start wondering if something's wrong with their evergreens. Chances are, nothing at all. Evergreens like these rhododendrons drop their leaves, too, but only after keeping them in service for multiple years. This white pine tree along the DR Canal towpath is getting into the act, becoming two-tone as it abandons older needles after their last year of service. It makes sense to drop older leaves rather than sustain them through the rigors and meager light of winter. You can tell, by the way, that it's a white pine by its clusters of five needles--the same number as letters in "white". And the age of the pine can be determined by counting the whorls of branches. You can tell which years were good years for growth by the space between whorls. Their lives, their triumphs and setbacks, are open books, ready for the reading.